Keith Johnson | The Salt Lake Tribune Women participating in the 2nd annual Ginormous Pumpkin Regatta paddle their pumpkins -- some weighing over 1,000 pounds -- across the finish line October 20, 2012 at Sugar House Park pond in Salt Lake City. Keith Johnson | The Salt Lake Tribune K.C. 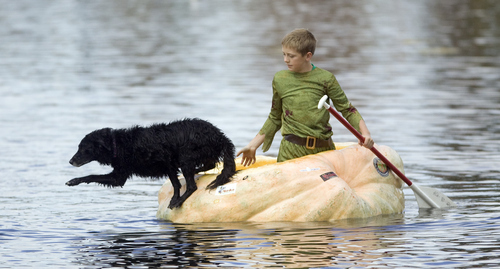 Fox helps his dog, Penny, out of his giant pumpkin during the 2nd annual Ginormous Pumpkin Regatta October 20, 2012 at Sugar House Park in Salt Lake City. Participants in costume raced giant pumpkins -- some weighing over 1,000 pounds -- across the pond. Keith Johnson | The Salt Lake Tribune Kyle Clark, left, and his sons Brent and Bryce line up to race Kyle Fox, center, and Nathaniel Holt during the 2nd annual Ginormous Pumpkin Regatta October 20, 2012 at Sugar House Park in Salt Lake City. 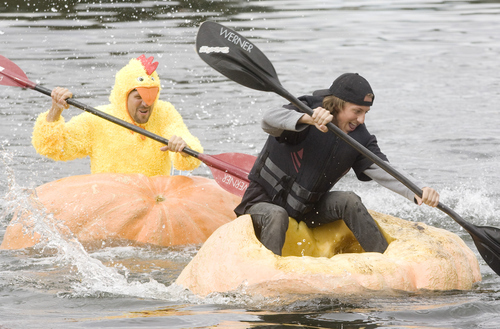 Participants in costume raced giant pumpkins -- some weighing over 1,000 pounds -- across the pond. Keith Johnson | The Salt Lake Tribune David Bradley helps his wife, Cathy, out of their giant pumpkin, "Mohana," during the 2nd annual Ginormous Pumpkin Regatta October 20, 2012 at Sugar House Park in Salt Lake City. Participants in costume raced giant pumpkins-- some weighing over 1,000 pounds -- across the pond. Keith Johnson | The Salt Lake Tribune Seventy-seven-year-old Ross Bowman sits in his "Brigham City Flash" pumpkin before racing across Sugar House Park pond during the 2nd annual Ginormous Pumpkin Regatta October 20, 2012 in Salt Lake City. Some of the pumpkins raced by the costumed participants weighed over 1,000 pounds. 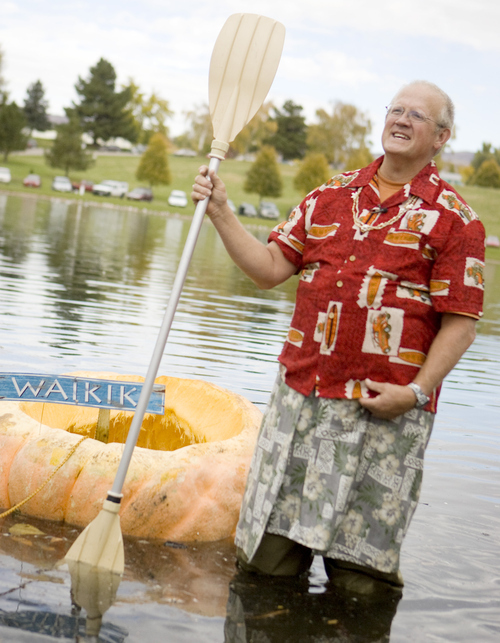 Keith Johnson | The Salt Lake Tribune David Bradley stands next to his pumpkin "Mohana" before racing across Sugar House Park pond during the 2nd annual Ginormous Pumpkin Regatta October 20, 2012 in Salt Lake City. Some of the pumpkins raced by the costumed participants weighed over 1,000 pounds. Keith Johnson | The Salt Lake Tribune Carrie and Kyle Fox, left, Cathy Bradley and Ross Bowman race their giant pumpkins on Sugar House pond during the 2nd annual Ginormous Pumpkin Regatta October 20, 2012 in Salt Lake City. 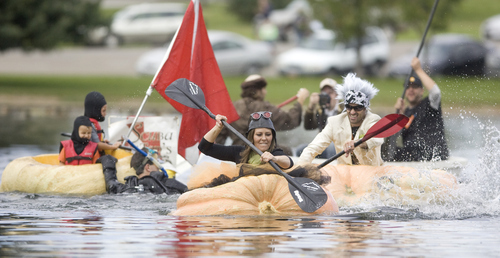 Participants in costume raced giant pumpkins -- some weighing over 1,000 pounds -- across the pond.. Keith Johnson | The Salt Lake Tribune Lance Heaton races across the pond at Sugar House Park during the 2nd annual Ginormous Pumpkin Regatta October 20, 2012 in Salt Lake City. 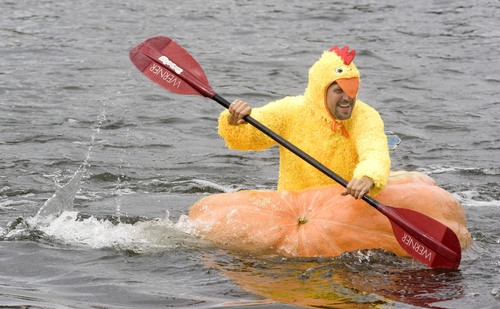 Participants in costume raced giant pumpkins -- some weighing over 1,000 pounds -- across the pond. Keith Johnson | The Salt Lake Tribune Kyle Clark puts his sons Brent and Bryce into the giant pumpkin he grew to paddle across Sugar House Park pond during the 2nd annual Ginormous Pumpkin Regatta October 20, 2012 in Salt Lake City. Some of the pumpkins raced by the costumed participants weighed over 1,000 pounds. Kyle has the state record for growing the largest watermelon at 130 pounds. Keith Johnson | The Salt Lake Tribune Lance Heaton, left, races Indy Heaton across the pond at Sugar House Park during the 2nd annual Ginormous Pumpkin Regatta October 20, 2012 in Salt Lake City. Some of the pumpkins raced by the costumed participants weighed over 1,000 pounds. Keith Johnson | The Salt Lake Tribune Dave Bradley, left, and Ross Bowman, in his "Brigham City Flash" pumpkin, celebrate after finishing the 2nd annual Ginormous Pumpkin Regatta Saturday in Sugar House Park. 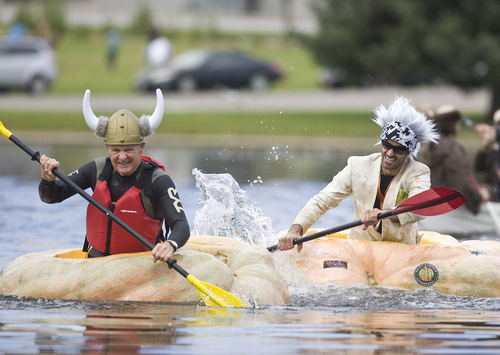 Keith Johnson | The Salt Lake Tribune Seventy-seven-year-old Ross Bowman, left, paddles his "Brigham City Flash" pumpkin ahead of Kyle "Thunder Patch" Fox while heading across Sugar House pond during the 2nd annual Ginormous Pumpkin Regatta October 20, 2012 in Salt Lake City. Some of the pumpkins raced by the costumed participants weighed over 1,000 pounds. 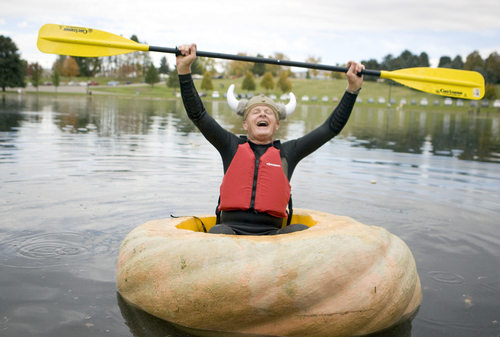 Keith Johnson | The Salt Lake Tribune Seventy-seven-year-old Ross Bowman lets out a Viking yell in his "Brigham City Flash" pumpkin before heading across Sugar House Park pond during the 2nd annual Ginormous Pumpkin Regatta October 20, 2012 in Salt Lake City. Keith Johnson | The Salt Lake Tribune Carrie Fox and her husband, Kyle, take the lead while racing during the 2nd annual Ginormous Pumpkin Regatta October 20, 2012 at Sugar House Park in Salt Lake City. 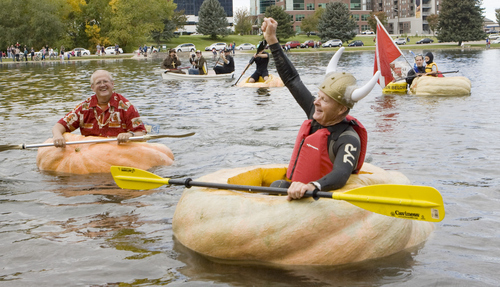 Participants in costume raced giant pumpkins -- some weighing over 1,000 pounds -- across the pond. 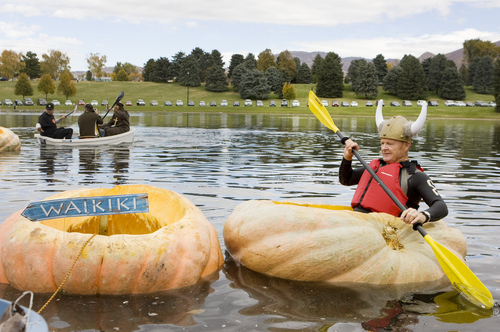 The pond at Sugar House Park was bobbing with pumpkins Saturday as people like 77-year-old Ross Bowman paddled his "Brigham City Flash" during the 2nd annual Ginormous Pumpkin Regatta. The racers made the dash across the pond dressed like chickens, pirates and other assorted characters. 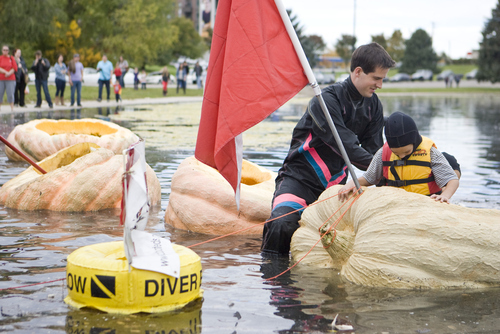 Some of the pumpkin boats topped 1,000 pounds.